Okay, I will admit that I have been rather lax of late, as far as this blog is concerned. I don't know where the time has gone! However, something I just heard on a podcast from The Reduced Shakespeare Company inspired me to look up the work of Nicholas Meyer, who not only directed the greatest Star Trek film of all time (Star Trek II: the Wrath of Khan), but also wrote a trilogy of Sherlock Holmes pastiches. The best known of his Holmes novels is, of course, The Seven-Per-Cent Solution, which was also made into a film by the same name. The other two are not as well known, although I'm sure most Sherlockians have heard of them: The West End Horror and The Canary Trainer. When I looked those three books up just now, though, I also found that Meyer will be releasing a FOURTH Holmes pastiche in October 2019: The Adventure of the Peculiar Protocols. You can read more about the upcoming novel at the publisher's website. I enjoyed Meyer's earlier novels, so I imagine I will have to check the new one out when it is released! I stumbled over this AV Club article about a bizarre German cover of Black Sabbath's "Paranoid,"which for some reason is about Sherlock Holmes. You can watch video of the cover below...the world is a crazy place. who is probably the Be next? This comic strip's punch line made me smile. One interesting Sherlockian item I recently picked up from the local library is a book by Martin Fido entitled The World of Sherlock Holmes. It's a nicely illustrated hardcover book that is going to make a neat addition to my Sherlockian library. There's no earth shattering new research in the book or anything like that, but it has a decent amount of basic info about Sir Arthur Conan Doyle and his famous character, and it's all presented quite nicely. I found it pretty cheap on Amazon.com, so it should be on its way soon! OK, confession time: I happen to be fascinated by a website called Frock Flicks, wherein costume experts review actors and films/TV shows that feature period costume, with often hilarious (and sometimes fairly profane) commentary. From time to time, I check in with the site to see what they've said about this or that period drama. 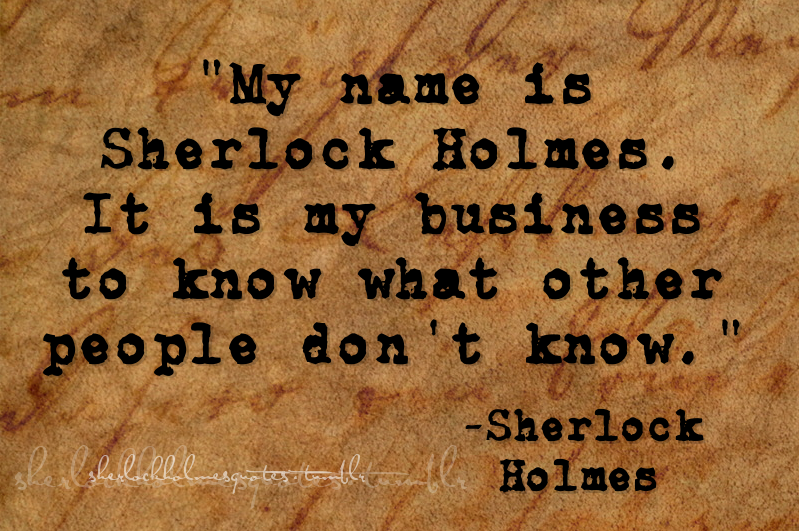 Frock Flicks: ​A Historical Sherlock Holmes – No, Not That One! 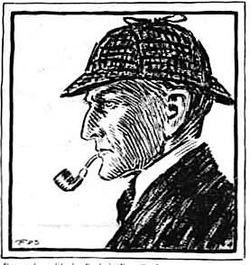 Recently, I've been acquiring a few volumes in Leslie Klinger's annotated version of the Holmes canon entitled The Sherlock Holmes Reference Library. (I did a post on this collection a couple weeks ago.) I encountered a little problem with a third party Amazon seller when I ordered The Sign of Four, that I think demonstrates one challenge that can make public domain works so tricky in this modern world. A simple Amazon search will find all kinds of editions of Sherlock Holmes very quickly. The problem is, the description of any individual volume does not always match the edition for which you are searching. When I ordered the Klinger edition of The Sign of Four, it showed not only a picture that matched that edition, but even had the correct publication number, including ISBN. Imagine my surprise, then, when I received a very small, cheap reprint with absolutely no annotations. I finally got the situation worked out, but ended up having to order a new copy for several dollars more. I've noticed a similar problem in the past when I was trying to find individual volumes of The Oxford Sherlock Holmes. What you search for doesn't always match what comes up. I've also experienced similar confusion with versions of Shakespeare (another public domain classic). The thing with public domains works is, anyone can reprint them and sell them at a pretty good profit. And there's little in the way of control of information that is available from online booksellers (Amazon isn't the only seller with whom I've experienced this problem in the past). So if you're looking for Sherlock Holmes editions on the Internet, be as careful as you can to be sure you're ordering the right one. Sometimes, even when all the info matches, you still get the wrong one, as I did with The Sign of Four. Don't get me wrong, I am very pleased that it is so easy to find books online, but with public domain works, there are some unique challenges. Happy shopping! One of my favorite sketch comedy shows is out of Brigham Young University's byuTV, a show called Studio C. They did a parody of the BBC's Sherlock in a sketch a few years ago. I wonder if they know how uncomplimentary A Study in Scarlet was to Mormons? Please await me. Terrible misfortune. Right wing three-quarter missing; indispensable to morrow.—OVERTON. The "three-quarter" referred to in the title is a player on a rugby team. 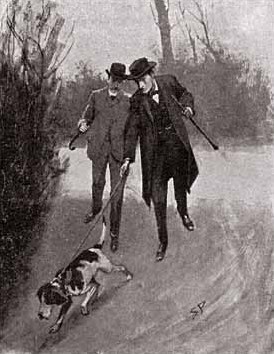 Godfrey Staunton is missing, and Sherlock Holmes, despite his lack of expertise in the real of "amateur sport" is on the case to find him. You can read the story (and listen to it) HERE.